It’s time, if you haven't already, to start making your opera selections for the 2017-2018 season, which is now only a month away. Washington National Opera leads off opera in the mid-Atlantic region with its first production starting on Sept 9; so let’s examine what WNO is putting forth. Upfront, here’s my personal dilemma. I have become a fan of new opera, and last season, WNO was strong in this regard. This year they seem to have taken a step back, most likely I'm guessing, due to undeserved weak ticket sales for Dead Man Walking and Champion; Kennedy Center audiences, like most audiences around the country, seem to favor the classic operas. That said, I must admit that the offerings for the next season are appealing to me. In fact, as a relatively new fan of opera, I am rather excited about the upcoming season, primarily because of two classic operas I haven’t seen, Alcina and Don Carlo, and because of the powerhouse singers coming to town for each of the productions. I'm not so excited as a fan of new opera. The one beacon for new opera from WNO is the American Opera Initiative’s January offering of new short operas, which could be especially interesting this season. Still, it is my hope that by going back to the past for this year’s selections that we are not seeing the future of opera from WNO. I plan to be in my seat for each of this year’s WNO productions, but it beckons that Opera Philadelphia and Pittsburgh Opera will continue to feature new works for the 2017-2018 season. Aida: photo by Cory Weaver; courtesy of Washington National Opera. Aida, by composer Giuseppe Verdi and librettist Antonio Ghislanzoni, can certainly be called an old warhorse, but there are good reasons for its popularity, mainly the music and the spectacle, and it’s consistently in the top ten to fifteen operas in terms of annual performances worldwide; it is a good choice for the September 23 broadcast to the Nats stadium for “Opera in the Outfield”. To WNO’s credit this will be a new production with costumes and sets designed by the artist RETNA (that’s correct, all caps); As a prelude, WNO is offering an exhibition of RETNA’s work at the Kennedy Center from Aug 14 to Sep 24. This is reminiscent of their production this spring of Madame Butterfly with stunning sets by the artist Jun Kenako; that staging substantially enhanced the performance, especially for those of us who had seen it before. I’ve only seen a couple of performances of Aida, and they were video recordings; it’s a good story involving a love triangle, though the performers in neither that I saw gave convincing performances. There is, however, no question the great music in Aida is some of Verdi’s best. WNO will also be including dance and acrobatics in this production, and the role of Aida will be shared by two excellent young sopranos, Tamara Wilson and Amber Wagner; Ms. Wilson has played Aida for the Met and Ms. Wagner, drew positive reviews for her performance in the Met’s recent Der Fliegende Hollander (The Flying Dutchman). I have high expectations for this production, but it's a toss up as to which Aida I'd rather see; maybe both. Angela Meade as Alcina: photo by Julio Rodriguez; courtesy of Washington National Opera. It’s Alcina that really gets my juices flowing. George Frederic Handel is best known in the U.S. for the Messiah, his oratorio that has become a part of Christmas for many of us. During the first half of the eighteenth century, however, he was the opera guy. I have a recording of his opera, Semele, staring Kathleen Battle that I love (but it might be mainly because of my love of her voice). Handel composed over forty operas, often more than one per year; yet, only a few have received production in the U.S. Alcina is currently (thru 8/17) being performed by the Sante Fe Opera, but that is the only other production in the U.S. in the last three years. In fact, Handel’s operas in total while reasonably popular in Europe have had no more than five U.S. productions in the last three years, most notably Guilio Cesare and Rodelinda. Alcina’s plot has interesting features, a sorceress on a magical island, an enchanted knight, a woman disguised as a man, and a magic ring, and it explores the nature of love and desire. It has gender-bending roles for WNO’s excellent young mezzos. Mezzo-soprano Elizabeth DeShong will play Ruggiero, a knight; this could be played by a castrato, but they are in short supply these days. Mezzo-soprano Daniela Mack will portray Bradmante, Ruggiero’s betrothed; she is pretending to be her brother, Ricciardo, to elude Alcina’s wrath; Ms. Mack is playing this role in the Sante Fe production. Headlining will be opera star, Angela Meade, as Alcina. The staging will be critical for Alcina. Handel’s operas focus on the arias; what will happen with the rest of the cast when one is being sung? Don Carlo: photo by Kelly and Massa; courtesy of Washington National Opera. Don Carlo is a power opera, both in terms of its subject matter and its effect on audiences, and is often accorded the term, masterpiece. The team of composer Giuseppe Verdi and librettists Joseph Mery and Camille du Locle composed a Parisienne grand opera in French including five acts and a ballet, titled Don Carlos. The history of this opera is extraordinary; there are many versions of the opera and many hands as well as Verdi’s in creating them. It was even cut just before the first performance so that it would end in time for the opera goers in Paris to get the last trains out of the city to the suburbs. There also was subsequently an Italian version, titled Don Carlo, which is the one most often performed now. And there were subsequently two Italian versions, the Modena version with the original five acts and the Milan version with only four acts. WNO is presenting the latter. The drama revolves around King Philip of Spain’s decision to take as wife, Elizabeth, daughter of the King of France, in order to end the war between the two nations; a complicating factor was that Elizabeth was betrothed at the time to Carlo, son of Phillip, and Carlo and Elizabeth were smitten with each other. Throw in some rival suitors and political intrigue and it gets messy, and Verdi brings it home with a stunner of an ending; can you say deux ex machina? There are lots of opportunities for emotional arias to be sung by a primetime cast, including Leah Crocetto, Jamie Barton, and Eric Owens. The Little Prince: photo by Scott Suchman; courtesy of Washington National Opera. It is traditional for opera companies to feature an opera especially appropriate for children during the holiday season. WNO is offering The Little Prince by composer Rachel Portman and librettist Nicholas Wright. This opera was previously offered by WNO in 2014 and is based on the Antoine de Saint-Exupery’s novella of the same title. The cast will come from the Domingo-Cafritz Young Artists and include the WNO Children’s Chorus. If Don Carlo is a warhorse, The Barber of Seville (or Il Barbiere di Siviglia in Italian) is a money horse. Composer Gioachino Rossini’s and librettist Cesare Sterbini’s spirited romantic comedy is consistently among the top grossing operas in the world. It is one of a handful of operas that you recommend to your friends who want to try opera. Actually, watching two different versions of this opera taught me just how different it can be depending on the players, especially depending on who plays the pivotal role of Figaro. Moldovan baritone Andrey Zhilikhovsky will make his U.S. debut performance in the role of Figaro. For that reason and because soprano Isabel Leonard, who plays Rosina, is a favorite of mine, I will even look forward to another refrain of Figaro, Figaro, Figaro, Fi-gar-ro. 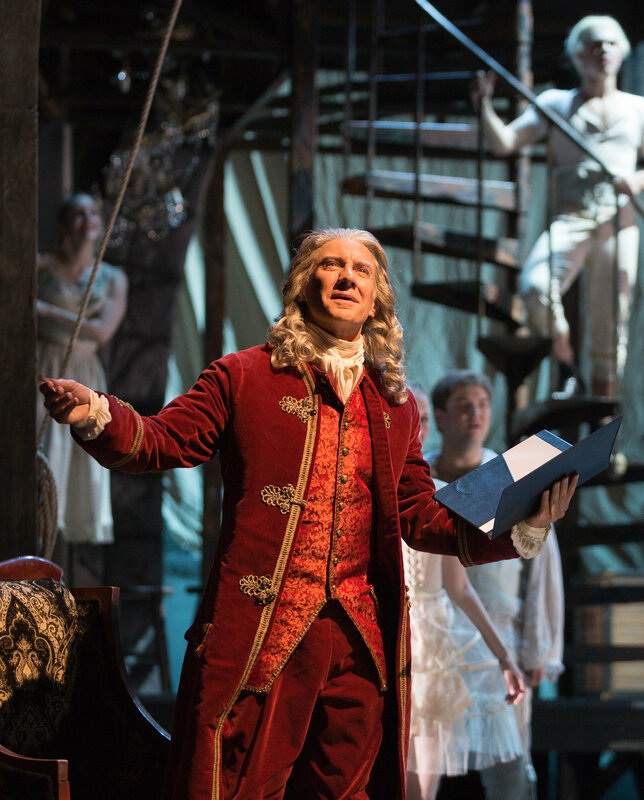 Left photo of The Barber of Seville by Cory Weaver and right photo of Candide by Karlie Cadel for the Glimmerglass Festival; courtesy of Washington National Opera. Candide could be interesting. It now seems to be labeled an operetta, but features the music of classical composer Leonard Bernstein. Having said that, I know him best for his fantastic score for "West Side Story". This Candide is based on Voltaire’s Candide; the music and libretto have undergone many revisions/additions with quite a few contributors. WNO describes it as a “funny, philosophical, and fast-paced take on Voltaire’s biting satire, which annihilates any notions of hope with its dizzying display of human depravity and catastrophic disasters.” It’s sort of like most cable mini-series, but will they be able to make it funny? Well, “House of Cards” was sort of funny; at least it was for a while. The draw for me here is the opportunity to hear Bernstein’s music. I have discussed the American Opera Initiative before and this year’s is highlighted by the one-hour opera, “Proving Up”, by composer, Missy Mazzoli, and librettist, Roy Vavrek. This duo’s outstanding Breaking the Waves (premiered by Opera Philadelphia) won the Music Critics Association of North America’s first Award for Best New Opera in North America. Proving Up is about homesteaders using a clever, but difficult, deception to acquire rights to their lands, which they were too poor to do otherwise. Jeff Sessions would not approve; I suspect we will. This offers water for my parched new opera lips and having seen Breaking the Waves, I anxiously await this one. In conclusion, Washington National Opera’s 2017-2018 Season, though disappointing for what it does not offer, is nevertheless, exciting for what it does. The Fan Experience: Individual tickets are available for all performances at this time, though tickets for the American Opera Initiative already have limited availability. If you are interested in buying tickets to more than one opera, check with the box office at 202-467-4600 to see if you are eligible for subscription pricing; you may be eligible for ticket and parking discounts and/or other benefits, such as the ability to change your ticket to an alternate performance date. Also remember that the Kennedy Center uses dynamic pricing which means that if certain performances are in high demand they may raise the prices for the remaining tickets.